Come and join us this August 1-2, 2011 at The Virginian Lodge in beautiful Jackson Hole, WY. Enjoy food, drink, and the beauty of Wyoming while you get current information to help prepare for the next school year! Get continuing education credits for PTSB, State Board licensures, and/or NASP certification renewal. Learn current research and gain up to date knowledge regarding ADHD, Autism, and child behavior from renowned expert in the field, Dr. Sam Goldstein, Assistant Clinical Professor Psychiatry at the University of Utah and Affiliate Research Professor of Psychology at George Mason University. 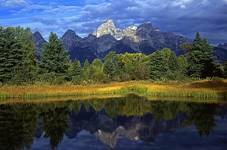 Network with colleagues at a barbecue in scenic Jackson Hole, WY and enjoy the beauty and outdoor activities available there. If you're still interested, the registration form can be downloaded and is available on the WSPA website (www.wspa-wy.org). Rooms may still be available at The Virginian Lodge at the conference rate; just mention WSPA. Any questions, please contact Erin Taylor-Hanson (ehanson@jcsd1.us) by email or phone (307-684-4550 x16). Provide participants with an overarching model to understand children's development and human behavior. Produce the four pillar model and conceptual means by which ability, knowledge, self-regulation and motivation fit together to understand, explain change behavior and educate children. Provide participants with a model of human ability and function. Provide participants with an overview and understanding of how abilities are applied to acquire knowledge. Provide participants with up to date knowledge concerning self-regulation and its relationship to ADHD. Understand human motivation and how children are hardwired for success. Provide an overview of the current research, understanding, evaluation and treatment of Autism Spectrum Disorder. Provide an overview of the science of resilience as an evidenced based concept and its application in the schools.